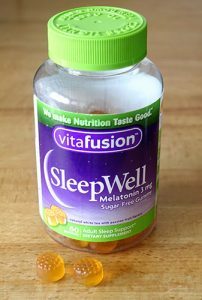 Vitafusion SleepWell is a sleep aid containing melatonin, passionflower, chamomile, and lemon balm. It’s sold over the counter in the US, where melatonin doesn’t require a prescription as it’s considered a supplement rather than a medicine. I decided to test it for a week to see if it would help regulate my sleep pattern, which was disrupted by traveling. And that’s the key point about melatonin – it’s not like a typical sleeping pill. Instead, it helps your body clock get back on track in situations like jet lag or shift work. 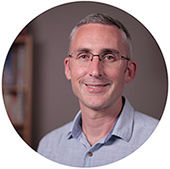 In this review, I’ll be describing my experience taking SleepWell for the week. And I’ll also discuss some useful points if you’re thinking of trying it yourself. I took SleepWell the night I got back from a trip abroad. My sleep pattern was around 3 hours in advance of what it usually would be. So I hoped the melatonin would help shift my bedtime earlier. The label just says to take them ‘prior to sleep event’. I interpreted that as 30 minutes before, and on an empty stomach. I took 2 gummies, which is the suggested dosage. They have a nice sweet flavor and are enjoyable to chew. I’ve had comments from readers before about children who’ve found a bottle of melatonin gummies and eaten several. And with the similarity to sweets, I can see why it’s a risk. I then went to bed and read a book, which is what I always do so I can keep an eye out for any noticeable sedative effect. I wasn’t honestly expecting to sense anything physical, but I did. In about 45 minutes I started to feel quite drowsy. I was admittedly tired anyway, but I couldn’t read any longer and turned the light off. I remember waking up a few hours later and going to the bathroom. I was still half asleep (or more!) and kind of stumbled out of the bedroom in a daze. I went back to sleep almost instantly and then woke up 7.5 hours after first falling asleep. That’s the ideal amount of sleep for me, so I was quite happy about that. When I woke up, it felt like I was waking from a very deep sleep. I usually wake up feeling instantly alert, but it took me around 30 minutes to shake the groggy feeling. It wasn’t as bad as the grogginess of anti-histamines like Nytol or Sominex, however, which is stronger and tends to linger for much longer. Other than a briefly cloudy head and heavy eyes, I didn’t notice any other side effects. I didn’t remember any vivid dreams either, which is often reported with melatonin. I took the same dosage of SleepWell every night for the rest of the week. On 5 of those nights, I got between 7 and 8 hours’ sleep, which is great. On 2 nights, it dropped back down to 6.5, which is still ok for me. Interestingly, I had the same effects as the first night all week. Disorientated when waking in the night to go to the bathroom and a brief heavy feeling upon waking. I don’t usually report what my sleep trackers say about my sleep stages when I review sleep aids, as they are never 100% reliable. However, there was a strong pattern this week which interested me. Every day, without exception, my total REM sleep jumped significantly. I actually felt on fine form all week during the day, and was able to perform consistently well in my sports. So perhaps there was an increase in REM sleep, and it was doing me good. 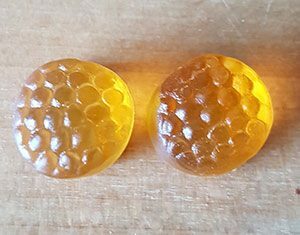 I feel that the SleepWell gummies worked well for me. I got a good amount of sleep all week, and my sleep schedule adjusted to the local time quickly. I felt good during the day, could work and exercise well, and the side effects were minimal. My only concern was the disorientated feeling when waking in the night. On reflection, I think I stumbled to the bathroom on a couple of occasions with poor coordination. I’d also be very wary of keeping them anywhere children can get to them. They seem to glow attractively in light, look like sweets and definitely taste like them. The glowing, tasty Vitafusion SleepWell gummies need to be kept out of children’s reach. Note that the gummies are gluten-free, but do contain tree nuts. The suggested dosage is 2 gummies prior to sleep. I found that taking them 30 to 60 minutes before bed worked well. Who is Vitafusion SleepWell intended for? This is an interesting question. Since it fits into the category of food supplements, it doesn’t have the same regulation as medicines. These statements have not been evaluated by the Food and Drug Administration. This product is not intended to diagnose, cure or prevent any disease…this product is not intended to treat insomnia or other sleep disorders. And that’s the kind of labeling you’ll find with many over the counter sleep aids containing melatonin and/or herbal ingredients. So essentially, they sell a product and suggest what it might help with. But it’s up to you to decide if you want to try it to help with a sleep problem you might have, based on your own research into the effectiveness of the ingredients. What does melatonin help with? 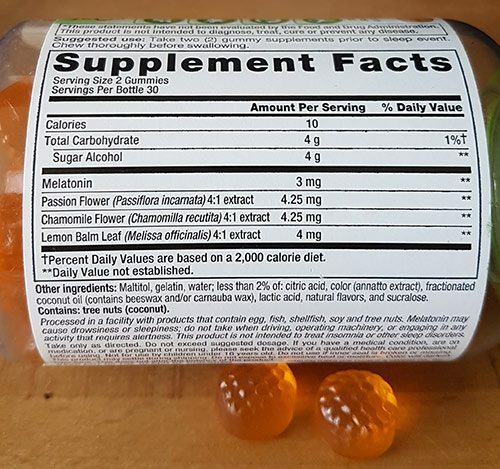 So if Vitafusion themselves aren’t legally allowed to say what it helps with, it’s useful to look at what scientific evidence there is for the ingredients themselves. And indeed melatonin is a strange one. It’s not a one-size-fits-all cure for insomnia or other sleep disorders, as Vitafusion state themselves. Insomnia for some people, with stronger evidence for older people. As for the herbal ingredients, there’s inconclusive evidence for them. But some studies do suggest that chamomile can help with anxiety and sleep. The label comes with little information about possible side effects and interactions. As it’s a supplement and not a medicine, there’s no requirement to list possible side effects. However, melatonin can cause many different side effects, even though most people tolerate it well. My advice is to research and understand the risks before you decide to take this, or any other melatonin product. You can find out more about possible melatonin side effects here. At the time of writing, Vitafusion SleepWell gets good customer reviews on various online stores. At Amazon.com it has a rating of 4.6 out of 5 stars, from 300+ customers. There are a low number of 1 and 2 star reviews, which is quite unusual for sleep aids and speaks well for the product. 140+ customers on Costco.com give it an average of 4.4 out of 5, again a respectable score. Have you tried the SleepWell gummies? It would be helpful to hear your experience in the comments below. I find these work well but I am very groggy for a couple of hours in the mornings if I take two. I find that just taking one does have an effect – I think I surface more in the night but do go back to sleep quickly. Also they take a while to work so I am trying taking them a bit earlier – at least an hour before I want to sleep – which means the grogginess wears off quicker. I have them for a trip I’m taking later in the year and am just trying them out at the minute to see how they work and test out my reactions. Thanks for sharing your experience. I think it’s fine to take a lower dosage if it works well for you too, and probably a good thing at that. And getting the timing right can definitely help with morning grogginess – and one reason why it’s advisable not to take more in the night if you feel they aren’t working. I will take them when I have trouble falling asleep, but have trouble shaking that disoriented feeling. I maybe tired later in the day as well after taking them. My dog found some and ate about 5 or 10. They were up on a shelf but he found them anyway. He hid his head from the light and stayed under a piece of furniture. He was fine by the next morning, but I always wondered what the effect was on dogs. Thanks for your comment. Poor dog! I’m glad he was ok the next morning. How long does the disorientated feeling last for you usually?